I am constantly on the hunt for ways to improve or increase effectiveness, and I’ve had my eye on the “Down Guard” position for awhile, so let’s start with some “Down Guard” background information. The “Down Guard” idea was generated out of safety and the ability to respond to emergency situations with more than one guard. We typically see this concept in facilities that have 1-3 (sometimes a few more) guard positions. It can be as simple as one guard is “on surveillance” and the other guard is the “Down Guard” for 15-30 minutes and then a rotation occurs and they switch places. During our recent visits to many facilities that use the “Down Guard” concept, I started to ask more questions and really observe what was taking place with the “Down Guard”. What I observed was the “Down Guard” position was basically a break position. Every once in awhile they would check chemicals, but mainly they left the pool deck, retrieved their phone and checked out in the guard office or guard room for the 15-30 minutes of their “Down Guard” position. We also did a recent survey online and the responses were also in line with what we were seeing in person. The top 3 answers that were most frequent and mentioned first as the “Down Guard’s” responsibilities were: Taking a break, cleaning, and being available to respond if an emergency occurs. This is a wild concept to me, as a former waterpark operator, this is not a thing in the waterpark world. I couldn’t imagine guards taking a break every 15 minutes or for 50% of their shift all day. It just isn’t how we operated. Rotations were constant, monitored by leadership, breaks were assigned every 3 hours and lunches if they worked longer. They rotated to ensure they didn’t experience constant surveillance for more than 60 continuous minutes, but they were always in a position and had a function or a role. I get the purpose of the “Down Guard” position: we want to rotate guards frequently to keep them fresh, we want to give them a break from surveillance, we have the secondary responder in case of emergencies…but how it is being executed is crazy to me. I think it is a waste to be paying a guard who is essentially on break half the time. I think a 15 minute focus session followed by 15 minutes of checking out may be perpetuating our lifeguard struggles with focusing. I think the current approach seems passive and reactive to me, not pro-active. Overall, I think we can do better. I think we have a great opportunity to add additional layers to our risk prevention and the safety of our pools. So, I started to think about how I would re-train and re-frame the “Down Guard” position to be more pro-active and to be an enhancement and benefit to our operations. A “WingGuard” could be in a pro-active position on the pool deck to run interference for the on surveillance guard. A “WingGuard” could do bottom checks of the water as they walk around the pool adding a secondary layer of prevention. A “WingGuard” could actively engage the swimmers / members / guests in the pool. Providing a cognitive wellness check. A “WingGuard” could talk and greet and look to answer questions and provide customer service to people in the pool area. A “WingGuard” could help support rule enforcement. A “WingGuard” could educate swimmers / members / guests on water safety and facility procedures. A “WingGuard” could eliminate distractions or interference that may occur to the on surveillance lifeguard. A “WingGuard” could warn the on surveillance lifeguard of any hazards or concerns identified in their deck level rounds. A “WingGuard” could stay alert for any medical events on the deck area and respond accordingly. 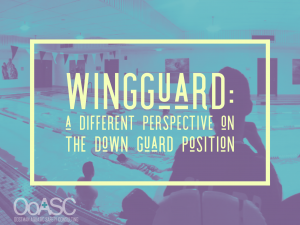 A “WingGuard” could clean and straighten during their physical rounds on the pool deck, but should stay safety focused with their focus on supporting the on surveillance lifeguard. I could go on, but I hope you are getting the idea of where I’m coming from. I think we can do better than operating with a guard who is mainly on break, on their phone, in the break room, away from the pool deck while the on surveillance guard has to control and observe the entire pool area by themselves. I don’t think guards need breaks every 15-30 minutes. (I think they should get a break every 3 hours or according to your labor laws.) I don’t think they should be on continual surveillance, but I think they can be doing tasks to increase safety and support the on surveillance lifeguard. I think there are so many opportunities to utilize our lifeguard labor more efficiently in these “Down Guard” type of operations. Would a “WingGuard” approach take re-training, a different mentality, some change to implement…Yes! Would it be worth it….I think so.